My name is (Michaels Helps) and I am (managing the JLA Project). Good morning and welcome to (Alter-E-Go Corporation)! My name is (John Doe). I’m responsible for (handling customer Support). I think most of you know me, but let me introduce myself anyway. As some of you already know, I’m (Johnny Bedd) and I’m (the Sales manager). Good evening! On behalf of our company, I’d like to welcome you! My name is (Michael Seatbelt). I’m in charge of (Customer Service). For those of you who don’t know me, I’m (Jane Doe) and I’m in the (IT) department. I’m (Anne Haverway) and I’m a (3rd year medical student at BXT University). Thank you very much (for the kind introduction Mr./Ms. Santori). Ladies and gentlemen, Good evening. I’ve divided my talk into three parts. First, A. Second, B. 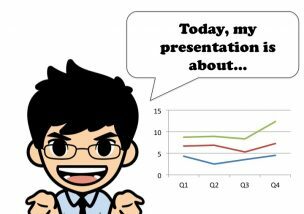 And finally, C.
My presentation is in three parts. First, A. Second, B. And finally, C.
My presentation is divided into three main sections. First, A. Second, B. And finally, C.
I’ll be speaking about these/the following main points. First, A. Second, B. And finally, C.
I’d like to give you a brief outline of my presentation. I’m going to start off with A, and then I’ll move on to B, and finally I’ll wrap up with C.
Today, we will look at three things: A, B and C.
My presentation will focus specifically on three things: A, B and C.
I have three topics to cover. First of all, I will (touch on) A. Then, I will (move on to) B. Finally, I will (go over) C.
Let me give you an idea of what I’m going to talk about. I will start off with A.
I will then (explain) B.
I will finish by (highlighting) C.
I will start by (showing) A. Then we’ll move on to B.
Lastly, I will (discuss) C.
I’ll begin by (reviewing) A. Then I’ll turn to B. To finish up, I will (give some information about) C.
First, we will take a look at A. Next, I will (introduce) B. Finally, I will conclude by (providing some information regarding) C.
I’d like to begin by (showing) A and then move on to B and my final point will be about C.
My presentation will only take/last (about/roughly) 15 minutes. I’ll take about/roughly 15 minutes of your time. This should only last/take about 15 minutes. I plan to be brief. It will only take 5 minutes of your time. I will need your attention/concentration for (about/roughly) 15 minutes. I’ll be happy to answer any questions you have at the end of my presentation. I’d be grateful if you could ask your questions after the presentation. I will take your questions after my presentation. There will be a Q&A session at the end. At the end of my talk, there will be a chance to ask questions. I’ll open the floor to questions at the end. I’ll open it up for questions and comments at the end of the presentation. I’ll be happy to answer any questions you have at any time. Please ask me any questions at any time. I’ll be more than happy to take your questions while I’m speaking. Please stop me if something isn’t clear. Please interrupt me if you need any clarification. My name is Ken Taurus and I work at ABC Corporation. Today, I would like to talk to you about our company. First, we will take a look at our company’s history. Next, I will talk about our current products and services. Finally, I will conclude by introducing our future plans. I hope that my presentation will give you a better idea of who we are. Let’s start with our company’s history.